The 75th Anniversary of the Blue Ridge Parkway in 2010 provides an extraordinary opportunity to create awareness, initiate dialogue in local communities, and take action that will insure a strong future for this resource. Blue Ridge Parkway 75, Inc. is a newly established not-for-profit corporation whose mission is to: plan, fund, and organize the events and activities of the Blue Ridge Parkway’s 75th Anniversary; educate the general public about the Parkway’s value and assets; and, through collaborative partnerships, realize the vision of the anniversary. This vision will engage local communities and the nation in efforts to sustain a healthy Parkway for future generations by celebrating 75 years of Parkway history, Appalachian culture, and spectacular scenic views. For more information, go to www.blueridgeparkway75.org. 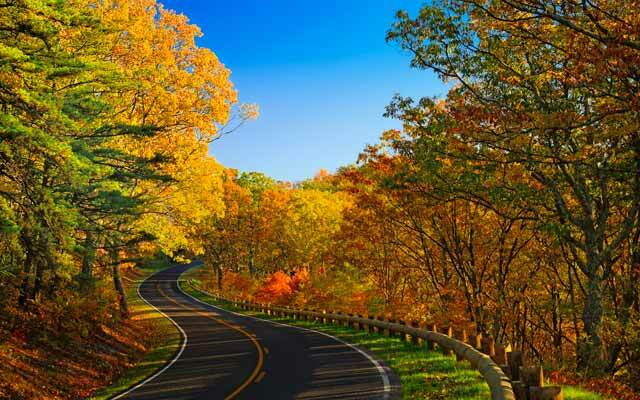 Virginia's Skyline Drive is a National Scenic Byway that runs 105 miles along the crest of the Blue Ridge Mountains starting in the north of the Shenandoah Valley at Front Royal to Waynesboro, where it meets the Blue Ridge Parkway. The drive is open to RVs and camping trailers, but they must be able to clear Mary's Rock Tunnel, which is 12 feet, 8 inches high near the Thornton Gap entrance at Rt. 211. Fall is the most popular time to travel along Skyline Drive, with its colorful foliage from late September to mid-November. But spring offers the most colorful wildflowers along the drive, as well as blooming azaleas and mountain laurel. Thornton Gap at Rt. 211 - See Mary's Rock Tunnel near this entrance. Rockfish Gap at Rt. 64 - this is also the northern entrance to the Blue Ridge Parkway. Speed Limit: 35 mph - various animals might walk down the middle or cross the road. With 75 overlooks spaced along the drive, you'll have plenty of opportunities to pull over to take photos, too. Driving Time: About 3 hours non-stop on a clear day. Tour Highlights: Skyline Caverns is famous for its Anthrodites — Orchids of the Mineral Kingdom — that radiate spike formations resembling flowers. These must be seen to be believed! 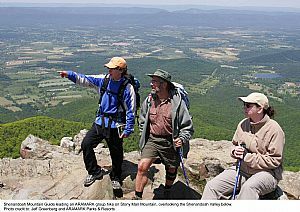 The famous Appalachian Trail runs parallel to Skyline Drive, and 101 miles lie in beautiful Shenandoah National Park, with 500 miles of hiking trails and plenty of wildlife and Outdoor Adventure Programs. Skyland Resort in the park offers quaint cabins to spacious suites with spectacular vistas. And Big Meadows Lodge offers rustic cabins to modern suites and multi-unit buildings offering views of the spectacular Shenandoah Valley. Four lodges and six restaurants are scattered along the Parkway and most are open from late April through the fall color season. The Peaks of Otter lodge and restaurant north of Roanoke, VA is open year round. Visit the many adjacent communities along the Parkway to experience regional hospitality and cuisine.